> All of us except Mycah returned to Tanda Malaika after hiking and chatting with Manfred. We were able to wash the mud from our bodies, fill our bellies and relax, but Mycah had yet another strenuous workout ahead of her! 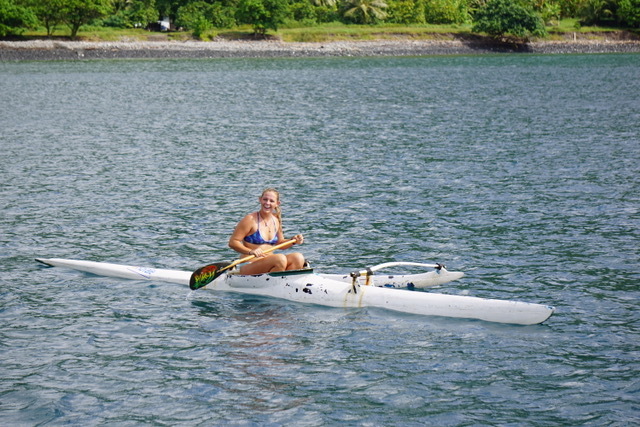 Atea had been waiting at the dock, ready to teach her how to paddle an outrigger, and Mycah was so excited! > I am so grateful that I raised the creatures to not be picky with food, but rather to be open minded and polite, because every one of them tried everything that was served, and ate all of it, commenting on how delicious it was. Kjira later admitted that she just swallowed her octopus whole, and Emma felt like it’s suction cups sucked onto the inside of her cheeks! 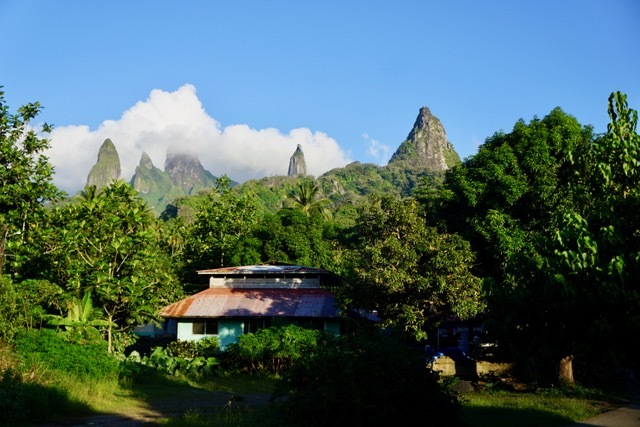 When we saw that Atea and his family were not using utensils, Emma leaned over and quietly asked if she could eat with her hands too – I told her of course, at which point most everyone followed suite. > After we finished eating, Atea told us he wanted to give us each a Marquesan name. Danny, he named Takitoa which means war spear, or protector. My name is Moeata, meaning natural beauty. Kjira’s name is Kua Anui, meaning beauties of many women. Jude is Heani, which is flower lei’s from the sky. Mycah is Vakaiki, which is canoe queen. 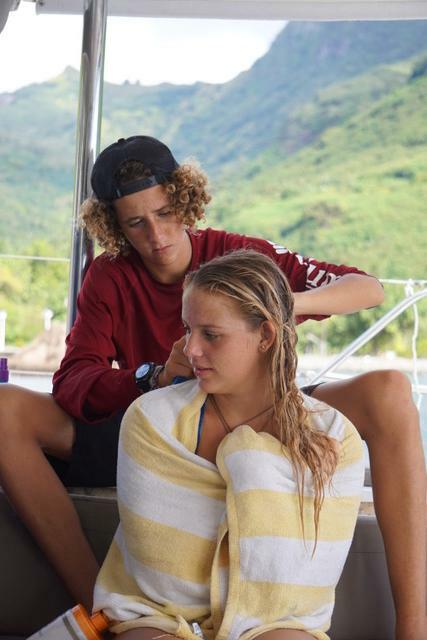 Aidan is Vakatua, which is canoe warrior, and Emma is Vaikehu, meaning princess. He took it all very seriously, and we felt honored that he would gift us with these names. > We glanced back one last time at the trees and vines filled with food, the happy faces and the beautiful scenery, and left part of our hearts behind. 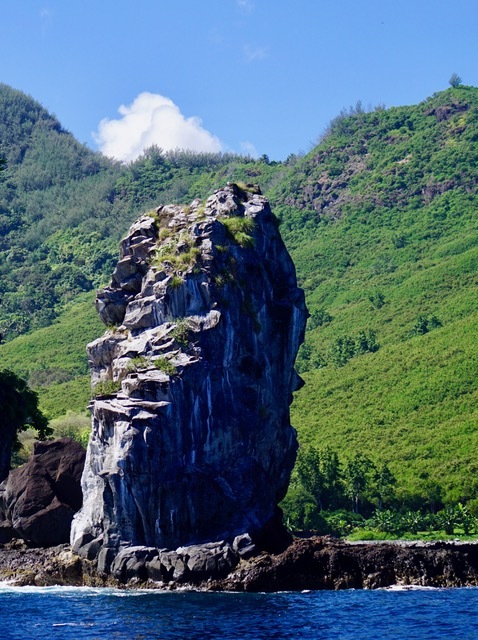 When I am on night watch in the middle of the ocean somewhere, or hiking some trail in a far off land, I’ll always be able to think back on the beautiful little bay in Ua Pou, where an elephant rock stands watching over the village, and angels roam through the streets and jungle trails. 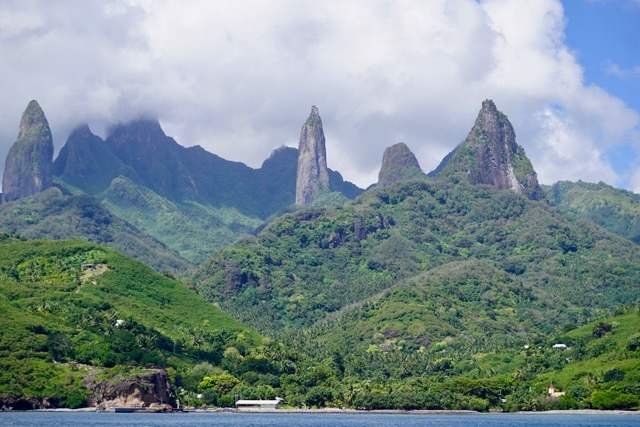 The only reason we can actually raise anchor and leave a place like Ua Pou, is because our visas for French Polynesia are only for three months and we still have so much of it to explore. Also, we know we need to be in New Zealand by October or November to be safely out of the cyclone belt. 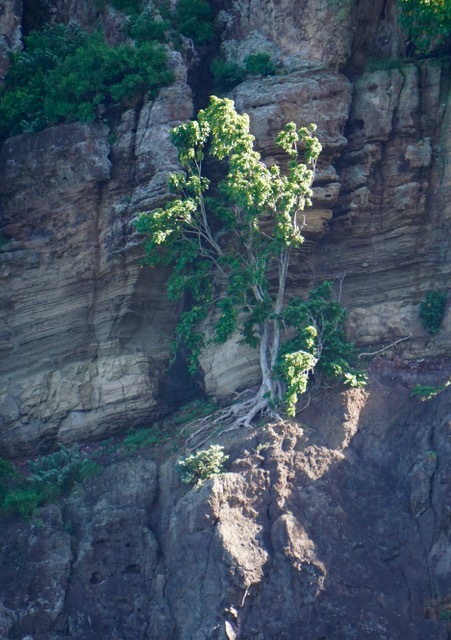 With that said, raising our sails and heading for Nuku Hiva was a bitter sweet experience. 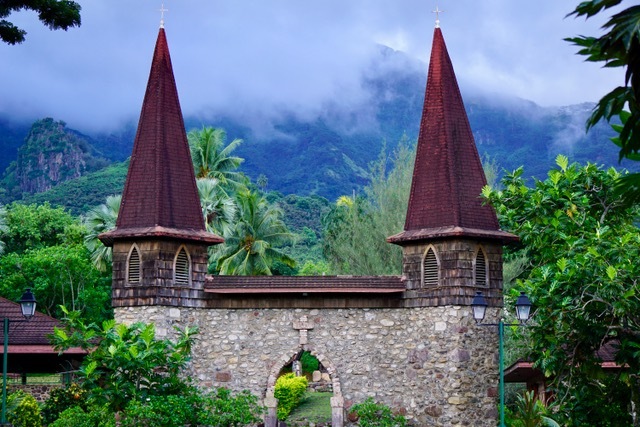 Nadia, Atea and the beautiful island of Ua Pou and the experiences we had there, will be part of the stories we tell our grandchildren and our children will tell their grandchildren. I am so grateful for memories. 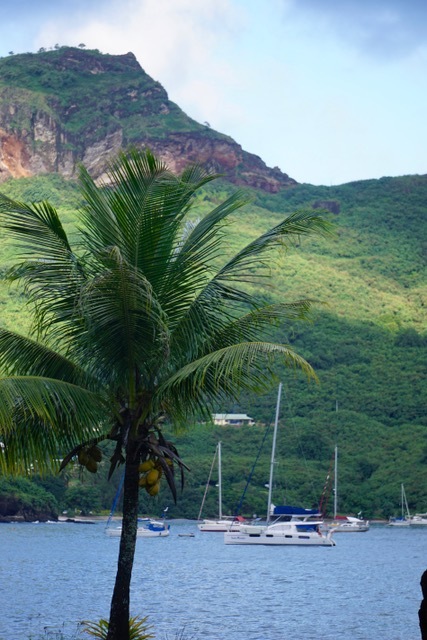 Nuku Hiva was about a four hour sail away, so I thought I’d take the time to try figure out what to do with the mountain of startfruit we were given. 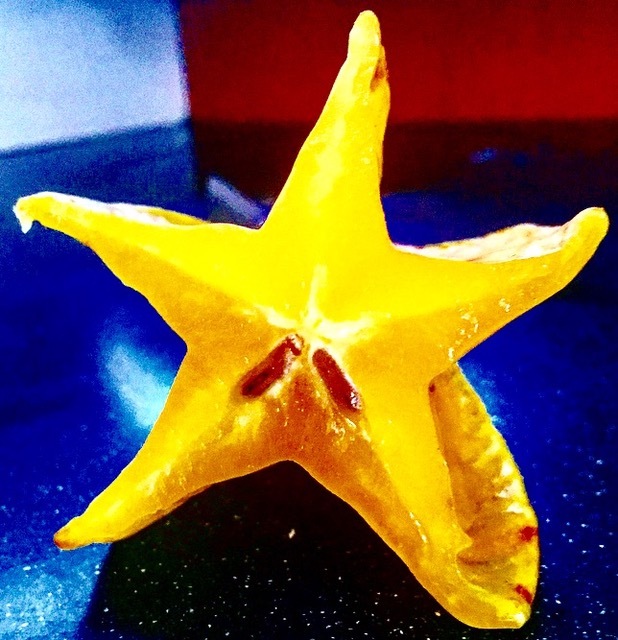 I decided to try make starfruit/banana juice. I washed and prepared several starfruit, placed them and the bananas in the blender, and Bob’s your uncle, a minute later it was all pulverized! I had to add a little sugar since it was quite sour, and poured a few glasses full for the family. Everyone except Aidan and Mycah were thirsty, Danny had a little while Kjira, Emma, Jude and I drank till we were overflowing with the pulpy deliciousness. It didn’t take long for it to work its magic in our bodies…we became nauseated and our bellies churned like a cement mixer on overtime! All four of us girls suddenly had important, intimate appointments with our porcelain thrones, and frequented them for the next 48 hours! I told the family that I’m going to market that juice as an excellent effective exotic exlax! 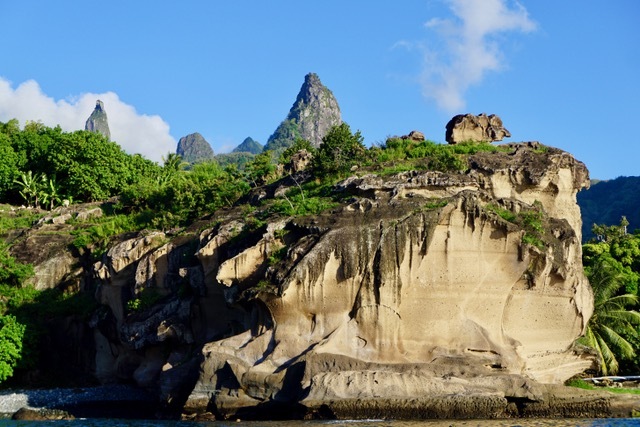 Nuku Hiva is the last of the Marquesan islands that we will visit before heading to Tuamotos. As we approached, suns rays was highlighting patches of land against a dark and cloudy sky. 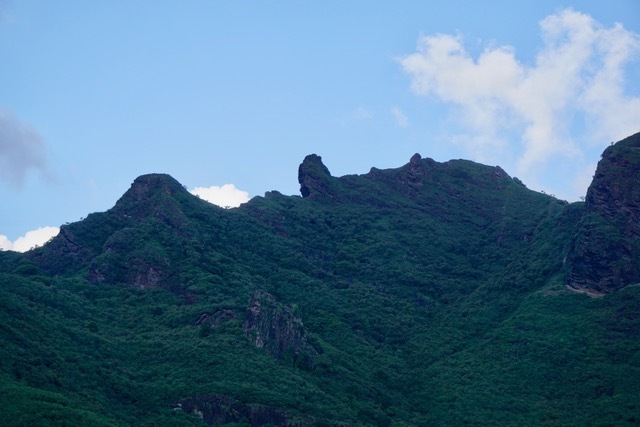 We noticed that the ridge of a mountain off starboard resembled the profile of a lumberjacks face. Notice his eyebrow off to the right, following down to his big nose, then lips and all the way down to his big beard on the left. 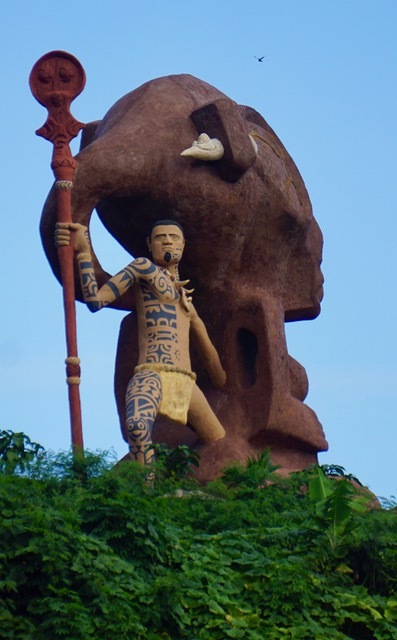 A large tiki watched us approach, standing proudly atop a small knoll, with full lips, healthy breasts and a rounded belly. 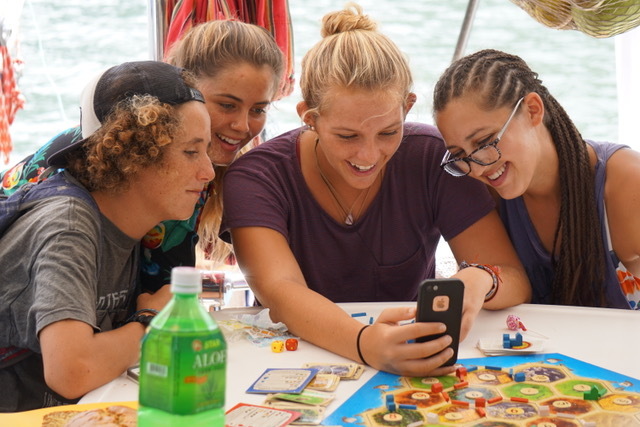 Shortly after anchoring we were able to hook up to wifi, and immediately made contact with Hunter and Nonna so we could see our sweet little Zailyn. We love our little angel so much. 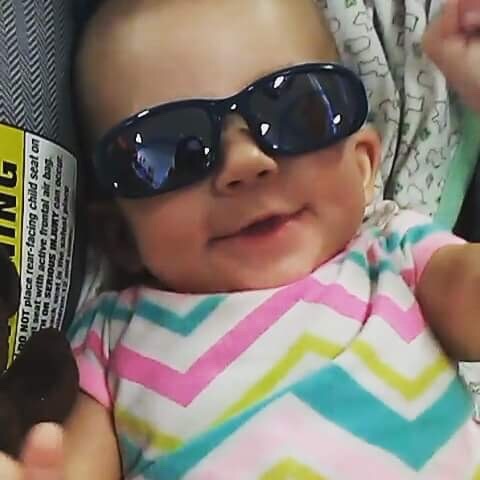 It’s easy to see from the photo that her aunts and uncle adore her! She has her first tooth, is four months old, rolls and scoots and can almost sit up alone. She fluently speaks in three different languages and has mastered calculus. Clearly, she inherited her grandmothers intelligence. 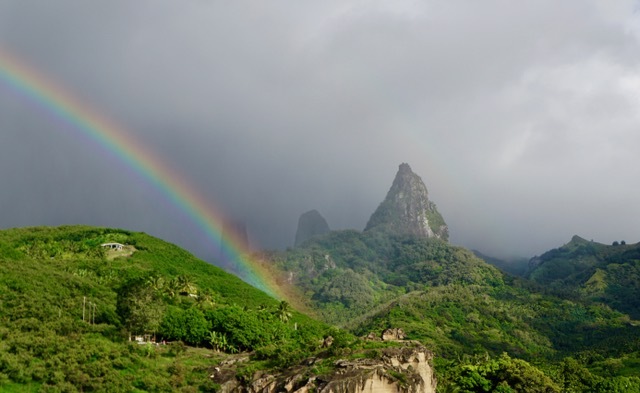 Nuku Hiva is the largest of the islands in Marquesas. 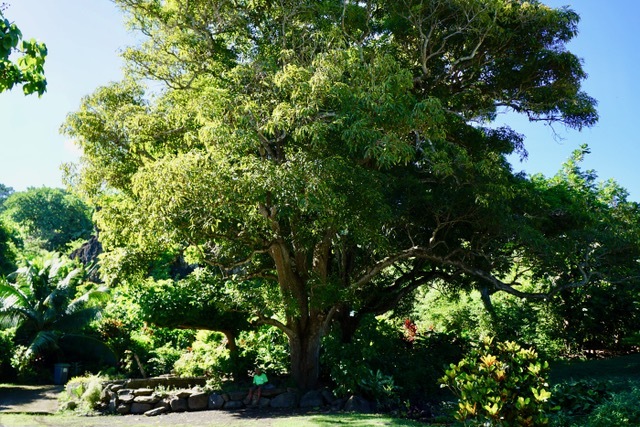 Like Ua Pou, there are many fruit trees and dense jungle covering the mountain sides. 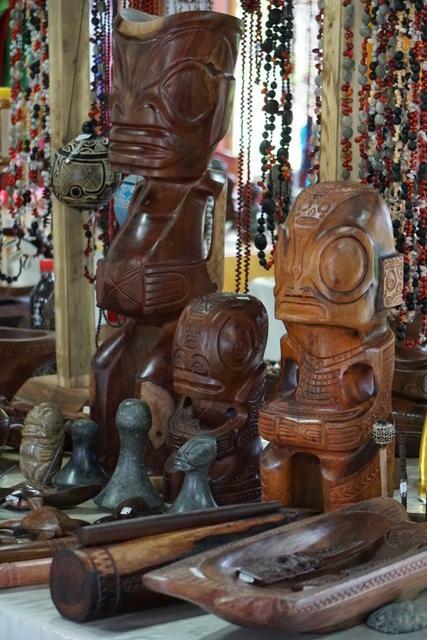 Artisans sell their hand made crafts of carved wooden tiki’s, jewelry, bowls etc. 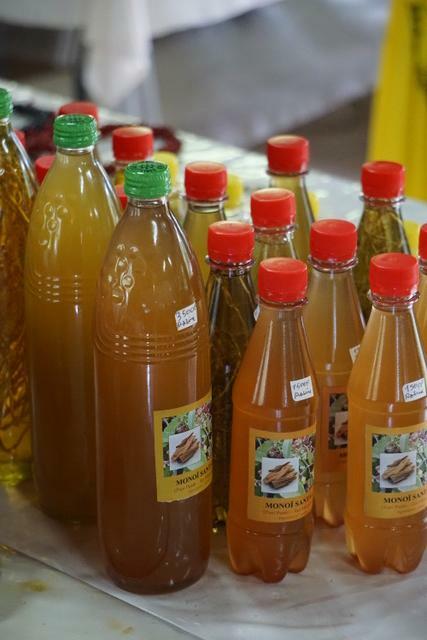 We’ve noticed several beehives throughout all the islands and local honey is sold here too. 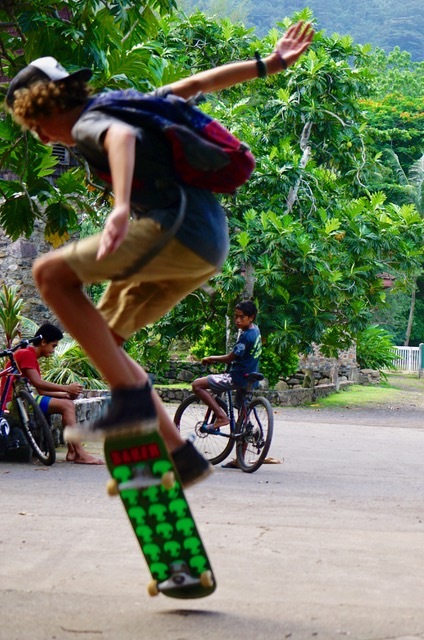 and once again Aidan enjoyed breaking out his skateboard for some tricks and exercise. 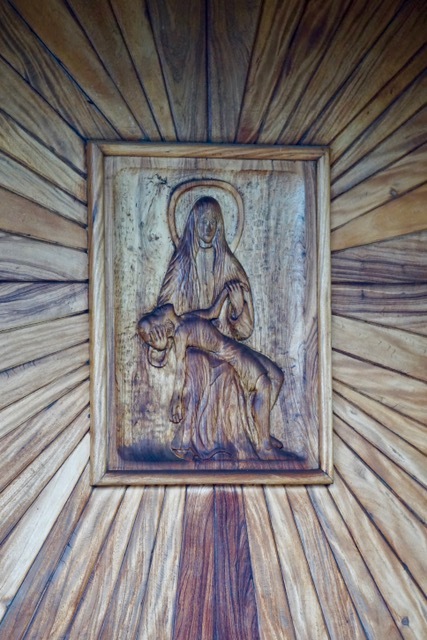 the doors carved in beautiful woods with amazing color. 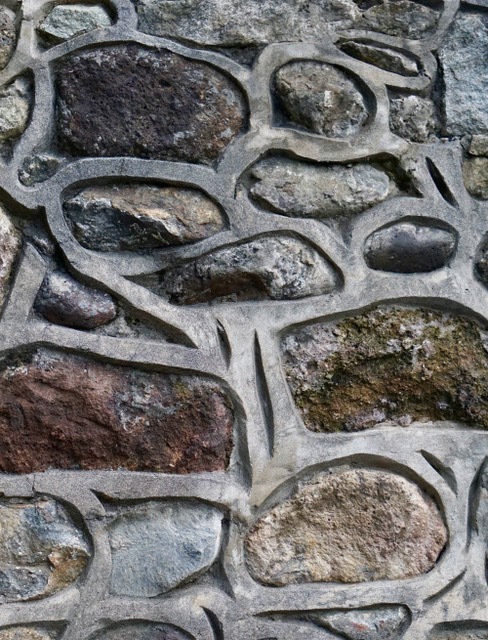 I love the way the stone work is done, with a thick boarder around each stone. 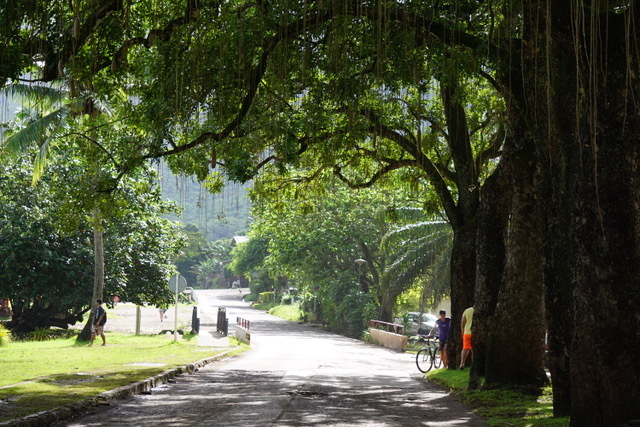 The grounds were quiet and and well kept, surrounded by mango and breadfruit trees. 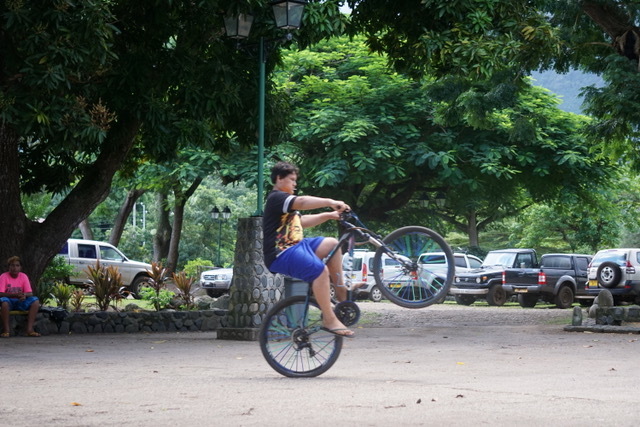 then made our way back out onto the street where kids were popping wheelies on the bicycles. 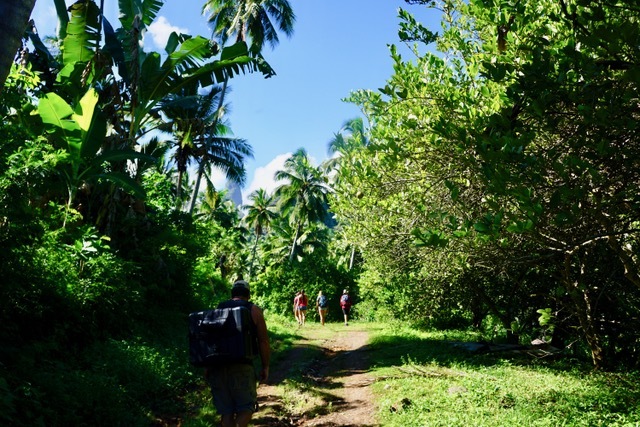 With the help of some locals, we collected a bag full of mangos, then continued on back to the boat. 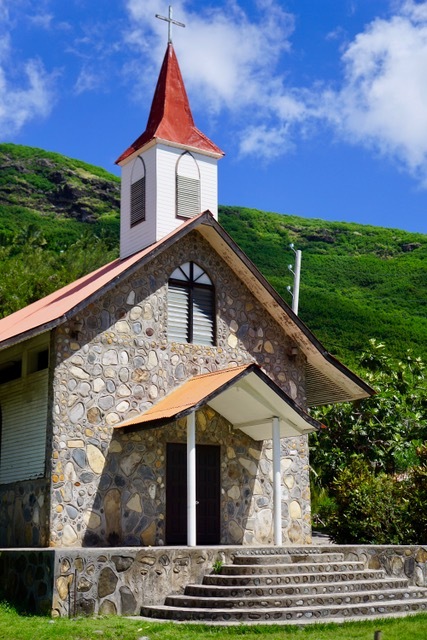 Nuku Hiva definitely feels less village like than Ua Pou, but the people are still beautiful and friendly and the scenery so gorgeous. Before we leave we will rent a car and drive around the island to get a better feel for it. All of us except Mycah returned to Tanda Malaika after hiking and chatting with Manfred. We were able to wash the mud from our bodies, fill our bellies and relax, but Mycah had yet another strenuous workout ahead of her! 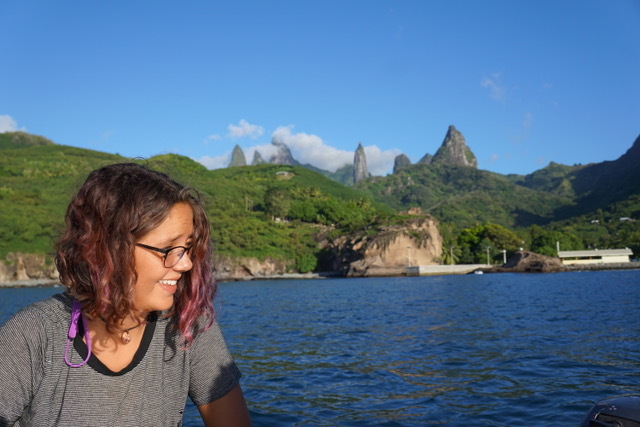 Atea had been waiting at the dock, ready to teach her how to paddle an outrigger, and Mycah was so excited!Atea let Mycah use his faster canoe while he used a slow wooden one, and off they went paddling around the bay. Mycah came close to the boat with a big smile on her face. She was thoroughly enjoying herself! After some lessons in technique, Mycah challenged Atea to a race, knowing he was the champion racer of the village, and he was such a good sport claiming that Mycah beat him. He laughed and said he gave her a lesson and she is now the champion of the village. after which Mycah returned, showered and rested her tired body while Aidan brushed through the knots in her hair with great concentration on his face – not wanting to hurt her. He is such a sweet brother. 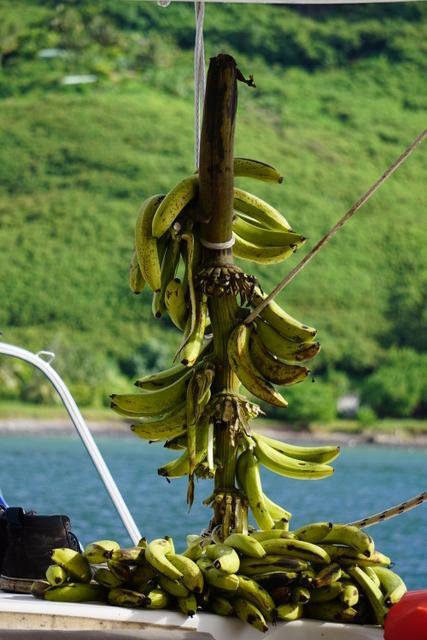 When we returned from our hike after the heavy downpour, we realized we had a banana disaster on our vessel. In the hot sun, every banana had ripened even though their skins still had a green color to them, and the heavy rain had stripped most of them off of the stem. We had a lot of bananas to eat in a hurry, so I whipped up a batch of banana bread, the creatures began eating and I froze many of them for future bread and smoothies. What a delicious dilemma. Danny and I lay out on the trampoline and suddenly before us was the most intense, beautiful rainbow we’d ever seen. We called the creatures out and all seven of us stood watching the unbelievably beautiful sight until it had completely disappeared several minutes later. We cut up a watermelon to take to dinner, Emma baked a tray of brownies, and I grilled tuna steaks and marlin. 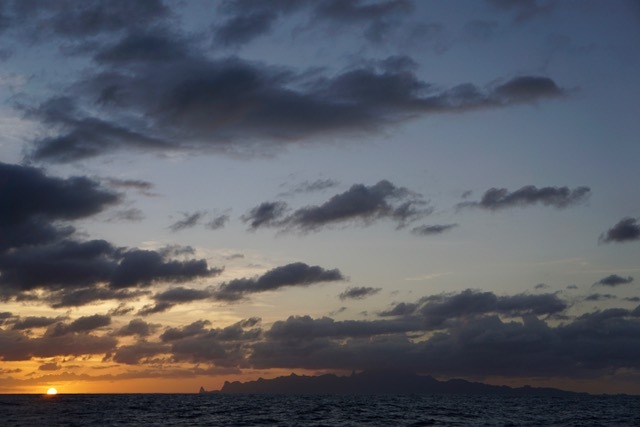 When the time came we packed ourselves into the dinghy and made our way to Atea’s home. 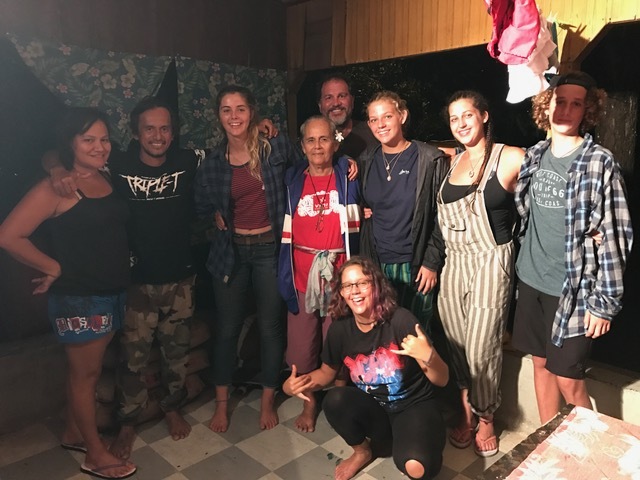 When we arrived we were greeted with hugs and kisses by Atea and his mother and were introduced to Nadia, Atea’s wife, and their two year old son, Haku. 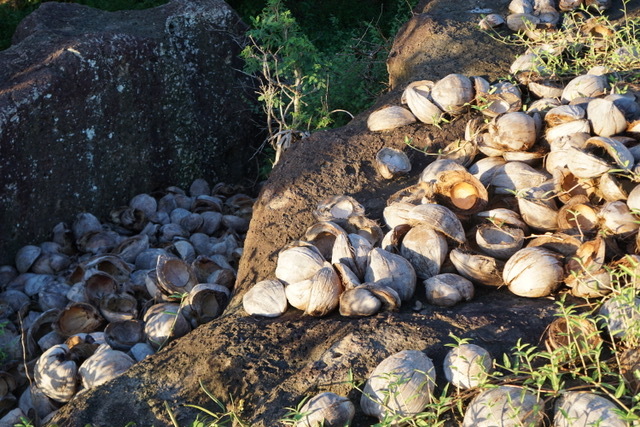 They had a huge spread of food, including breadfruit prepared in two different ways: One was a pot of it baked and broken up into sections, and the other was a type of breadfruit dough looking dish that one pours coconut milk over and eats with their hands. 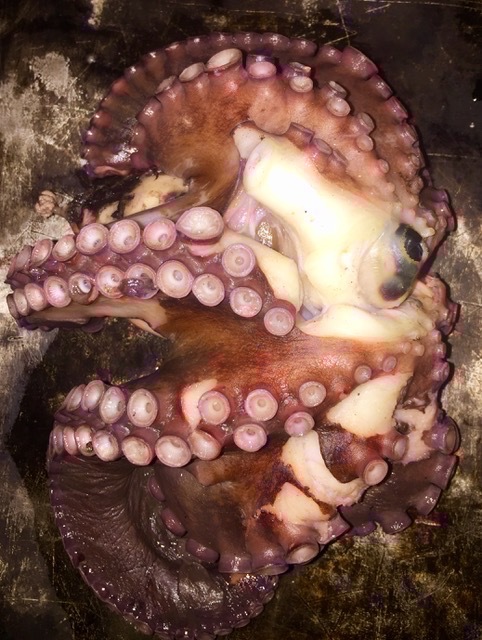 They also prepared a dish with raw fish and cucumbers, also baked bananas, stewed wild pig that Atea had hunted for, and large grilled fish of some sort, baked or boiled octopus (not sure), baguettes, rice and a mashed banana puree of some sort. I am so grateful that I raised the creatures to not be picky with food, but rather to be open minded and polite, because every one of them tried everything that was served, and ate all of it, commenting on how delicious it was. Kjira later admitted that she just swallowed her octopus whole, and Emma felt like it’s suction cups sucked onto the inside of her cheeks! 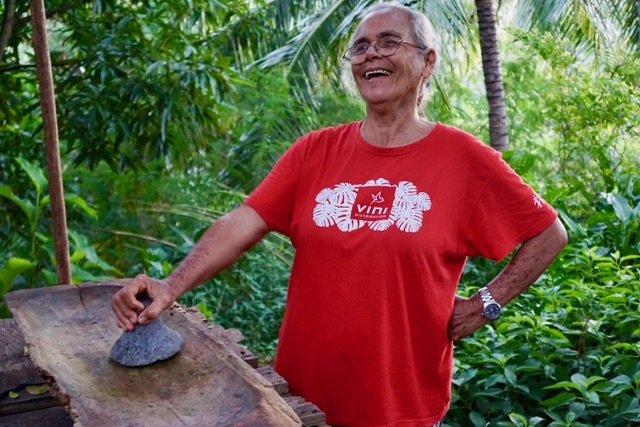 When we saw that Atea and his family were not using utensils, Emma leaned over and quietly asked if she could eat with her hands too – I told her of course, at which point most everyone followed suite. 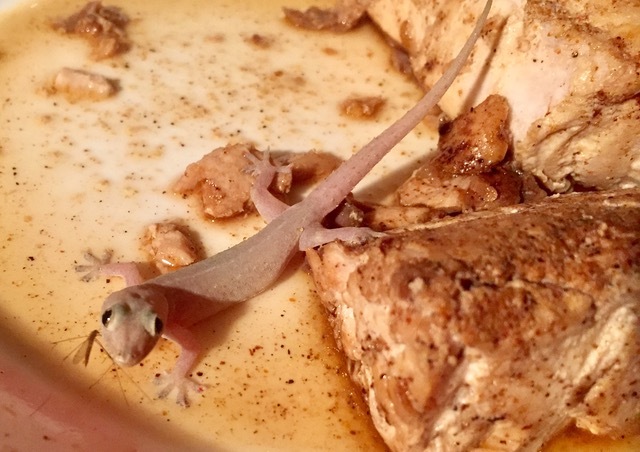 They especially loved the marlin, and during the meal a gecko fell from the ceiling onto the marlin plate with a bug in its mouth. After we finished eating, Atea told us he wanted to give us each a Marquesan name. 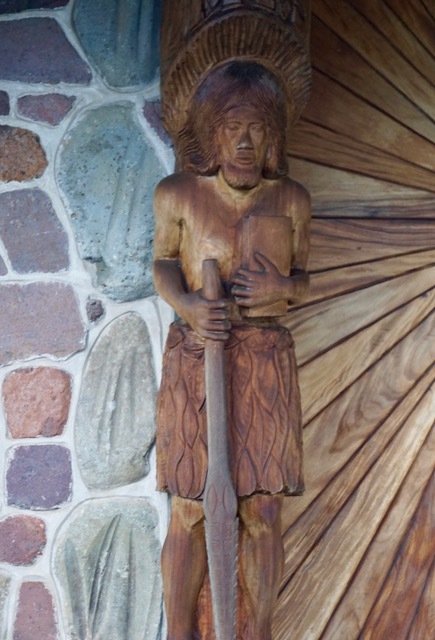 Danny, he named Takitoa which means war spear, or protector. My name is Moeata, meaning natural beauty. 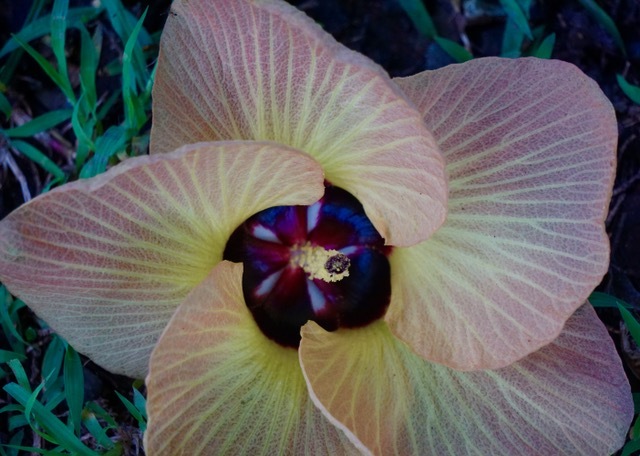 Kjira’s name is Kua Anui, meaning beauties of many women. Jude is Heani, which is flower lei’s from the sky. Mycah is Vakaiki, which is canoe queen. Aidan is Vakatua, which is canoe warrior, and Emma is Vaikehu, meaning princess. He took it all very seriously, and we felt honored that he would gift us with these names. Eventually after a wonderful evening together, we decided it was time to head home, and left them wth all the food we’d brought. They sent us home with breadfruit and pork. What absolutely wonderful, beautiful people. We truly love this village and these people. The following day Atea paddled out and Danny took some pictures of him, loaded them onto a thumb drive, and left them with him for future use. We was so excited when he saw himself on the screen. 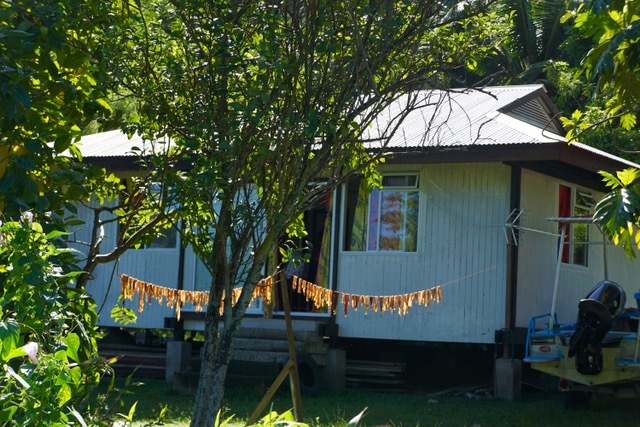 As we walked out of the village for the final time, we noticed thin slices of tuna hanging out to dry. We glanced back one last time at the trees and vines filled with food, the happy faces and the beautiful scenery, and left part of our hearts behind. 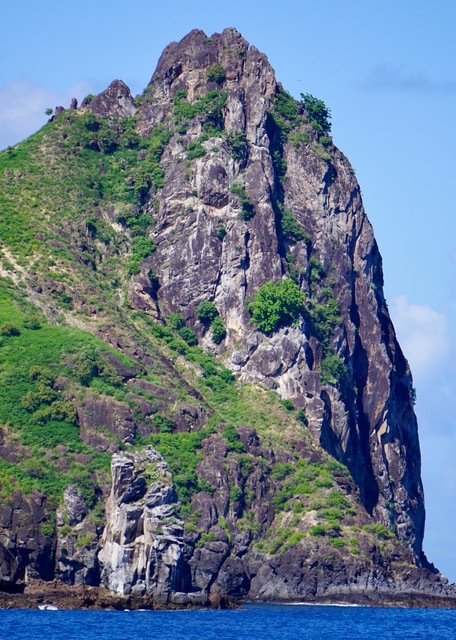 When I am on night watch in the middle of the ocean somewhere, or hiking some trail in a far off land, I’ll always be able to think back on the beautiful little bay in Ua Pou, where an elephant rock stands watching over the village, and angels roam through the streets and jungle trails. We met Atea on the dock just before 9am, and piled into the back of his truck so he could take us to the road where our hike began. The morning was beautiful and clear, the air so clean, and the sun already spreading its warmth quite intensely. 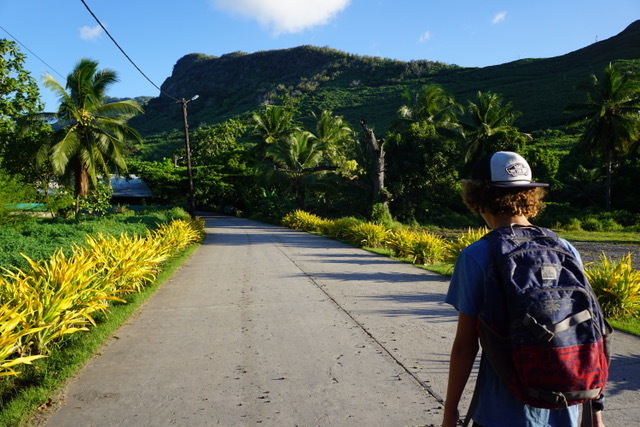 Atea dropped us off at the edge of the village and showed us with hand signals and broken English mixed with French, which direction to go. 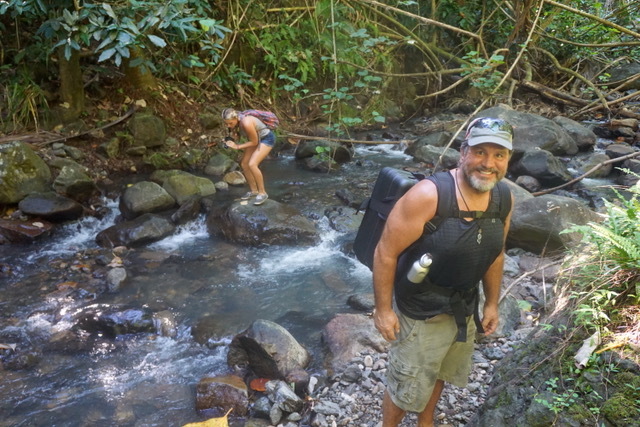 Our backpacks were slightly weighed down with water bottles, pampelmouss and cameras, and we excitedly set off on our adventure. 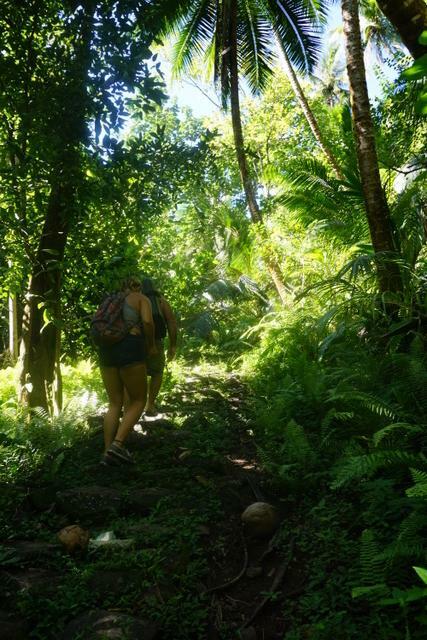 Coconut palms and banana, breadfruit and lemon trees grew thick along the sides of the trail, and the ground was really muddy in areas from all the rains. After about a mile we veered off through the foliage down a smaller trail and crossed over a small stream. 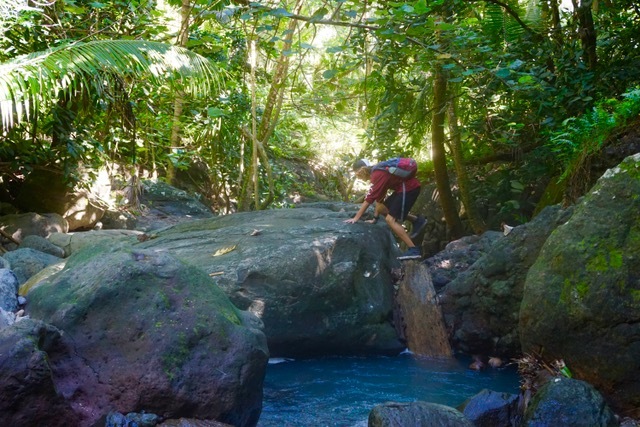 Aidan had so much fun jumping from boulder to boulder as we worked our way deeper into the jungle. 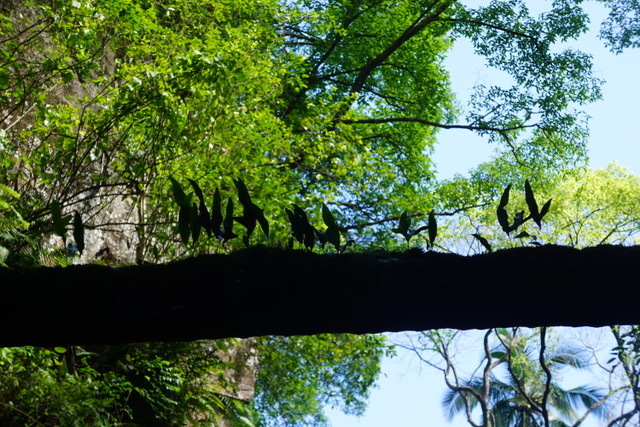 Birds called throughout the trees, tiny lizards hurried away from our approaching footsteps, and the sound of insects and water filled the humid air. Mosquitoes feasted on us as we dripped with sweat from climbing up and down in elevation in the heat – only ever so slightly cooling in the shaded areas. 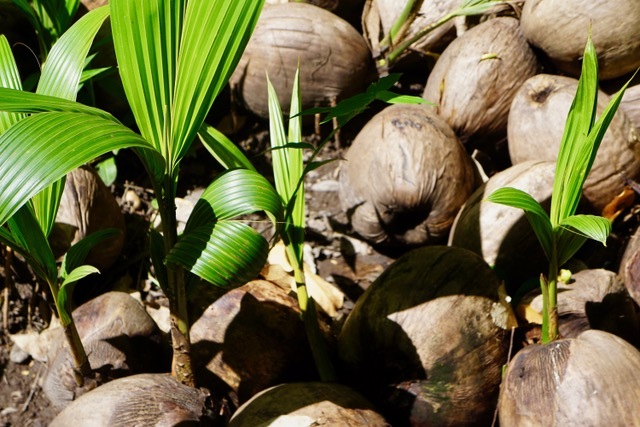 Many coconuts lay on the ground, and from several of them, new palms were already beginning to grow. 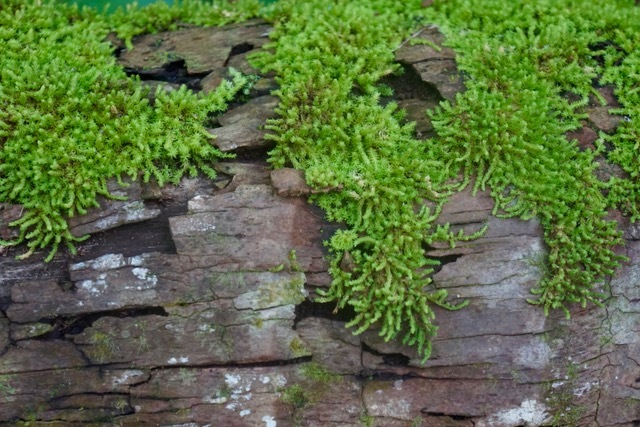 and lichen and moss grew on every possible surface like a spreading plague. 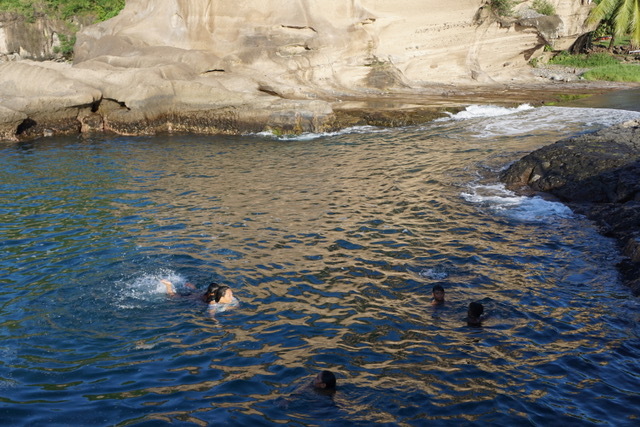 Eventually we rounded a corner where deeper water had collected, forming beautiful inviting pools of blue. 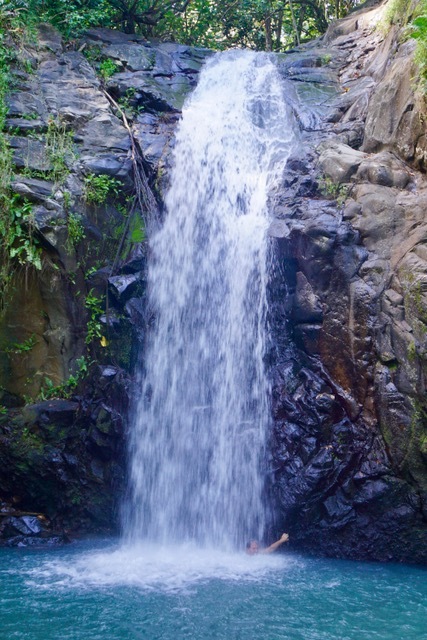 The sound of rushing water kept us moving just a little further, and not far beyond was what we had been searching for…Vaieya Falls. 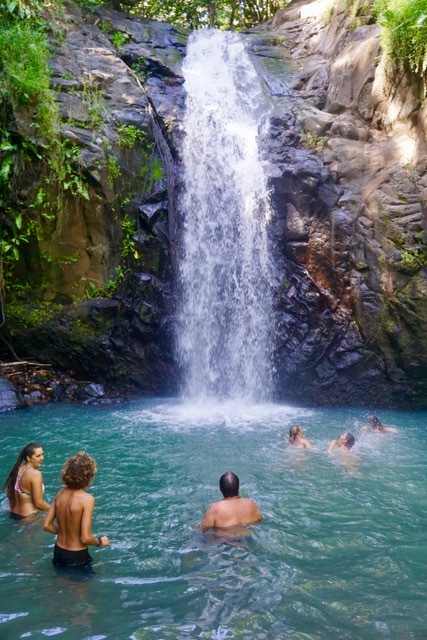 We immersed our hot, sweaty, mosquito bitten bodies in the cool water and it felt so good! 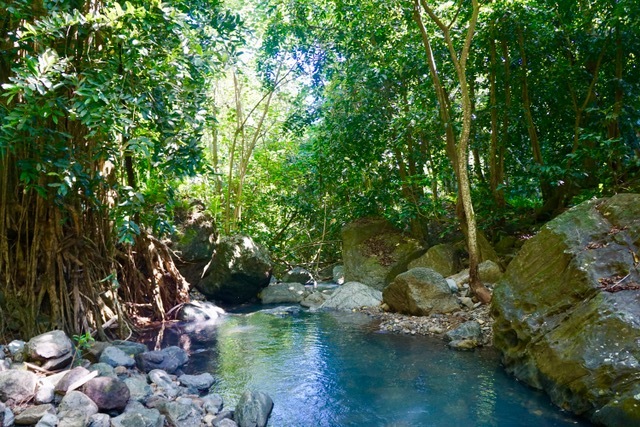 What a beautiful, refreshing gift in the middle of the jungle, in the middle of a little island, in the middle of the South Pacific Ocean! 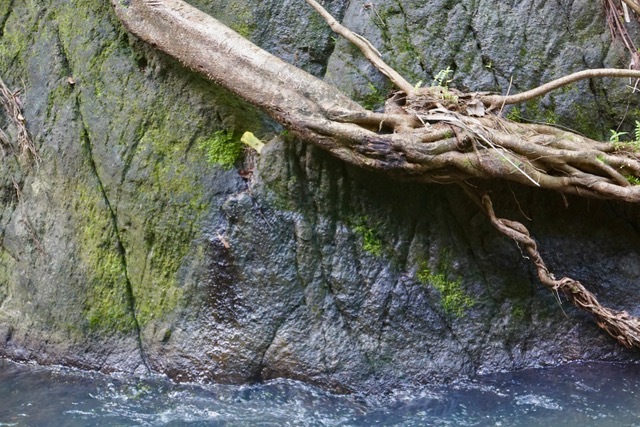 or roots down the sides of a rock mountain. 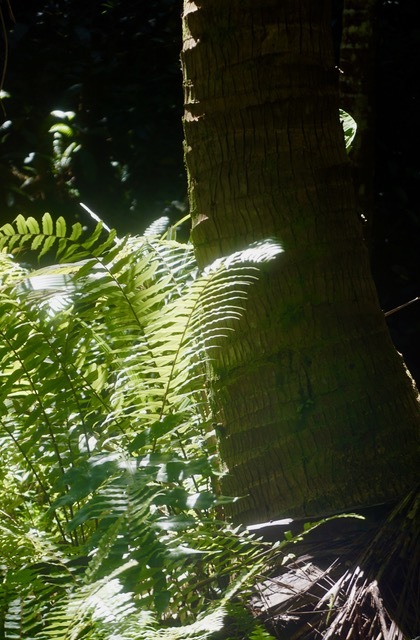 So much new growth among such abundant life – an endless cycle of living and green and growing. We walked back along the trail we had come in on, feeling refreshed and ready for what lay ahead. Spectacular views of mountains, trees and water, led us all the way back to the village, and along the way a truck pulled up with a German man in it. He introduced himself as Manfield, and said he has a house in the village we should come to where he sells chocolate. 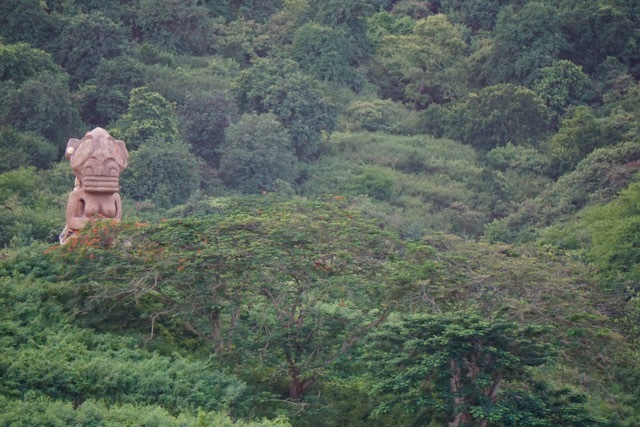 Up higher in the mountains he has many Cacao trees and makes 100% pure chocolate to sell around the islands. 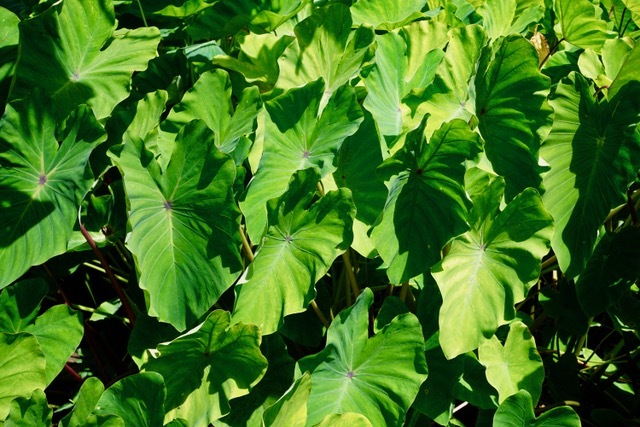 and a field of taro. Manfred told us to walk until we passed a large rock, then take a left into his driveway – which we did, and he met us with a big smile. We sat on his covered back porch where we had a beautiful view of our home in the bay, and he talked and talked and talked. A very interesting character who spoke about times in East and West Germany, of moving several times and ending up in Ua Pou. Of being a massage therapist and sleeping with many of the women he massaged. He spoke of the many wives he’d had – sometimes more than one at a a time, which he believes is a smart thing for a man to do because women offer him so much inspiration. The wives didn’t know about each other of course and were in different countries and islands, but he was now a single man. 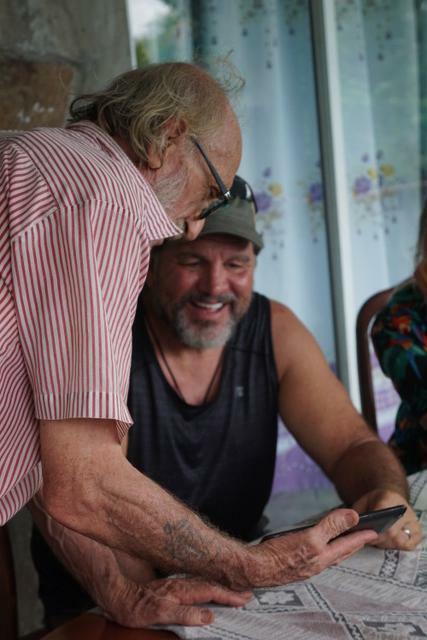 He showed us books and video of clearing his land and growing cacao. It began raining hard, and since the salon hatches were open on the boat, we finally politely broke free of his endless dialogue and made our way home. Exhausted yet feeling so good. We climbed into the family car and motored to the village, curious to meet the locals and see the surroundings. 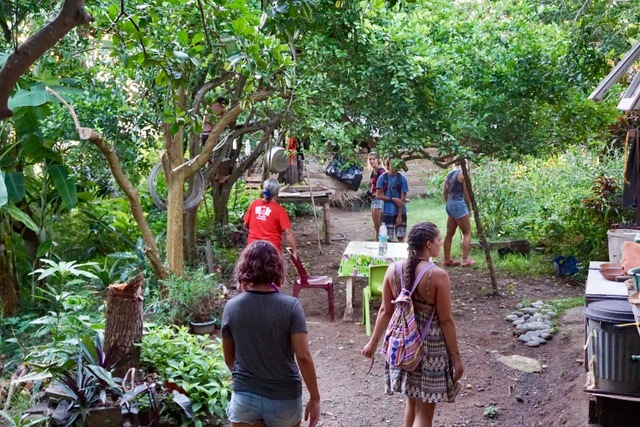 We had no idea that we were about to set foot in the Garden of Eden where the most wonderful people live. 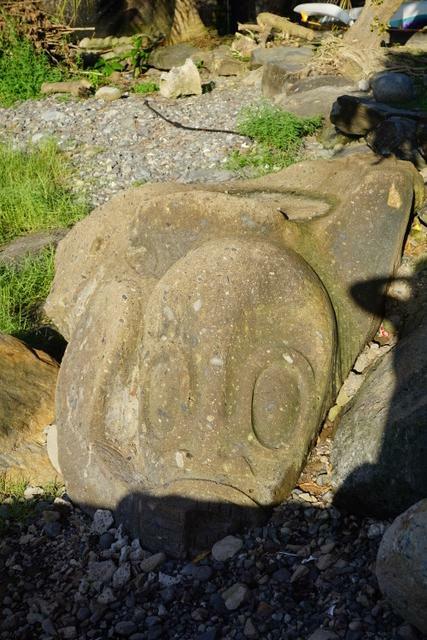 As we approached the dock, Danny pointed out that the big rock on top of the sandstone outcropping looked like an elephant! children playing on the beach, and an old stone Tiki lay crouching like it was watching us approach and guarding the village. Streets were paved with concrete and looked clean and well maintained. 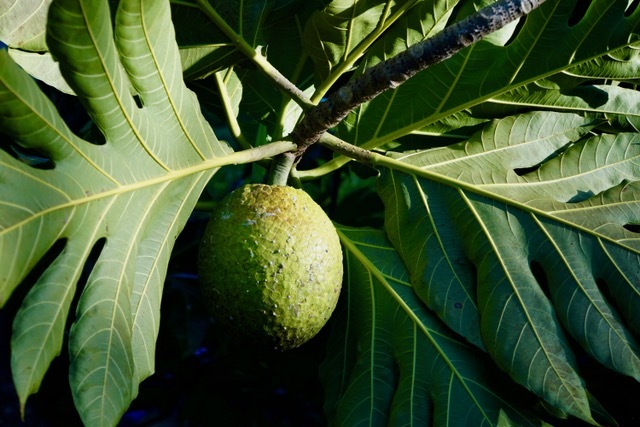 As we walked through the village we noticed that every tree was a fruit tree, ranging from giant mango trees, to starfruit, papaya, coconut, breadfruit, pampelmouss, orange, lemon, banana, pomegranate, noni, soursop, guava, and also passionfruit vines. 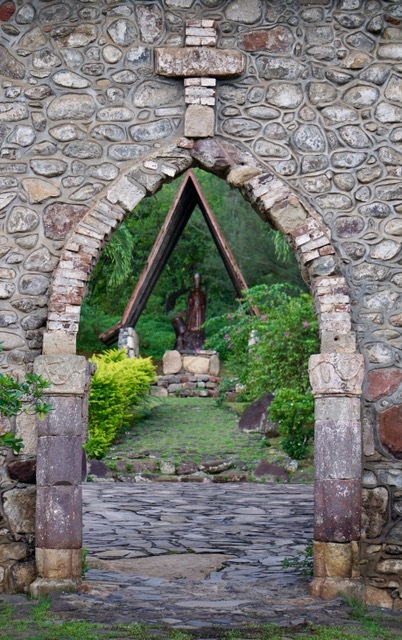 It was incredible, everywhere we looked, food was growing…like we’d just entered the lush, green Garden of Eden. 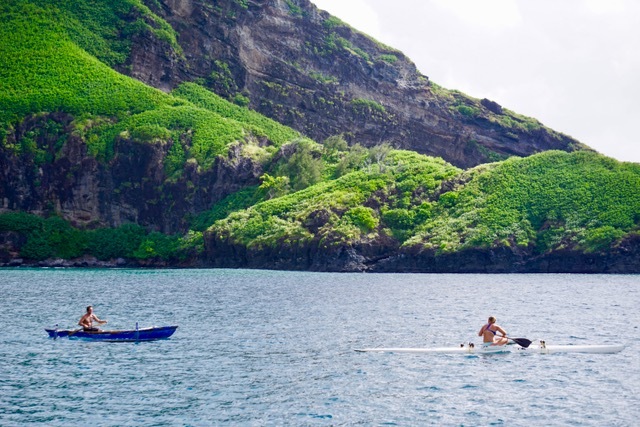 We met a local man named Atea, who was about to paddle his outrigger canoe in the bay. Luckily he spoke broken English, so we asked him where we could purchase some fruit and baguettes, and he told us where to find the bread and that afterward he’d take us to where we could purchase fruit. After purchasing a few 70c baguettes, we walked through town, and at the end of the street the view was spectacular. 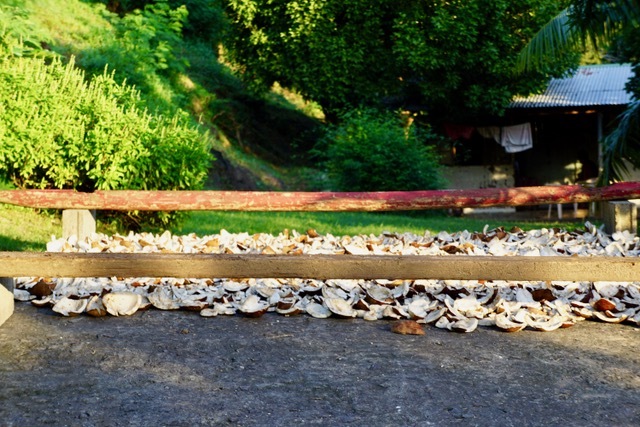 and then we noticed how coconut had been laid out to dry in the sun at the top of someones driveway. At night corrugated metal sheets are placed on the wooden poles to cover and protect the drying fruit. 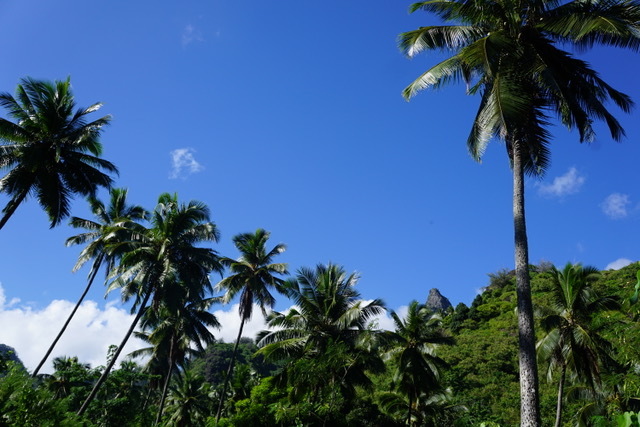 We later found out that much of the coconut is then taken and sold in Nuku Hiva and Tahiti. 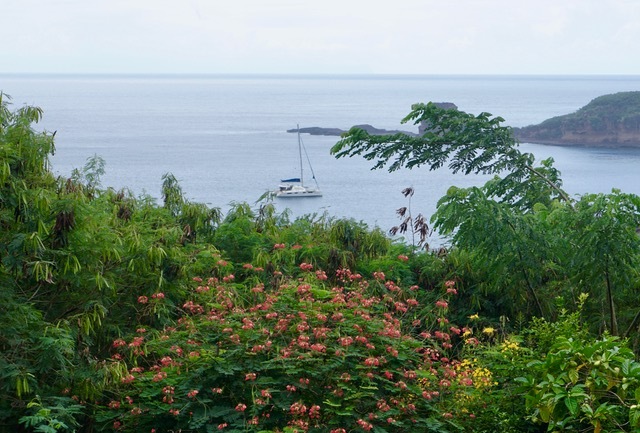 Danny found a great lookout spot and took a picture of the bay through the fruit trees. Farther down the road I caught a glimpse of our home, anchored safely in our new surroundings. 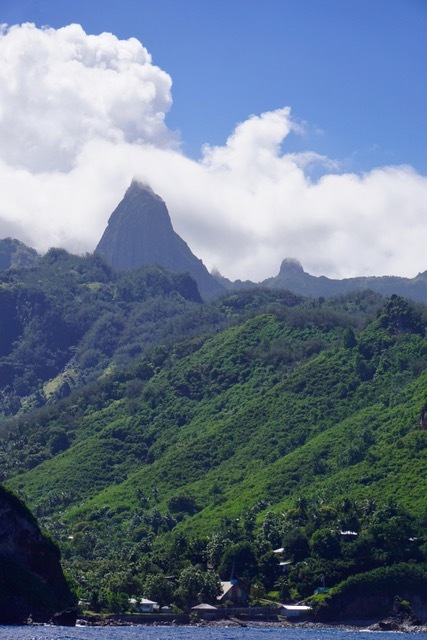 We heard a truck approaching and turned to see that it was Atea, done with paddling practice and ready to take us. We all loaded into is truck and he drove us up to his sweet mothers home to pick fruit. 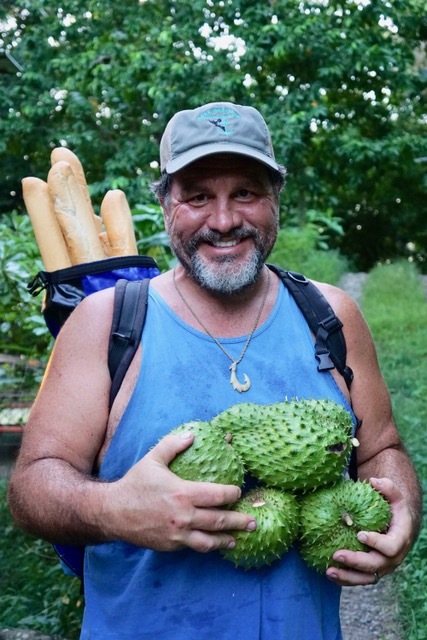 Danny got an armful of delicious soursop. 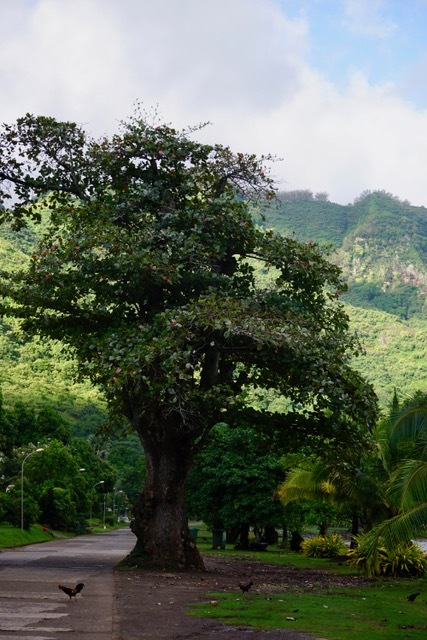 Atea had the creatures follow him around while he picked pampelmouss, tons of starfruit which they don’t eat, and bread fruit. He offered bananas but we still had the entire unripe bunch hanging on he boat. 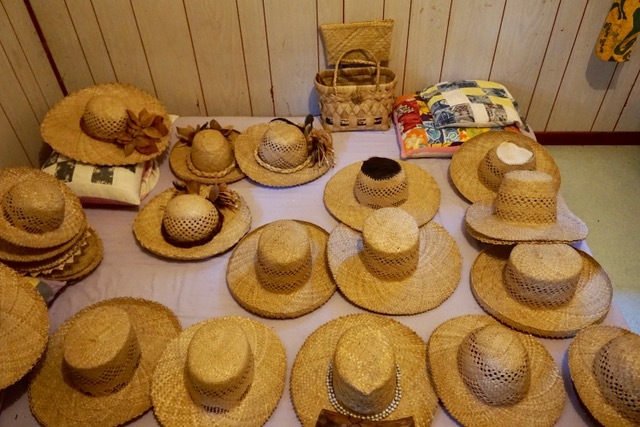 and also the many straw hats she makes to sell. Every once in a while she will load them up and go over to the other islands and sell them. 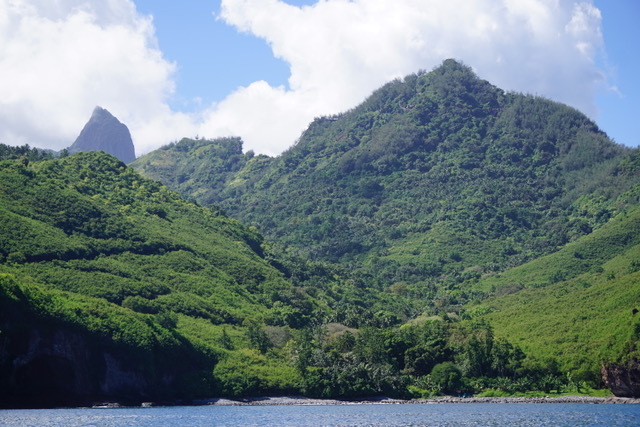 When Atea dropped us back off at the dock, he told us to come back in the morning so he could direct us to where there’s a beautiful hike, and that him and his family would like us to join them for dinner tomorrow night. We told him we’d be honored, and would supply the fish. 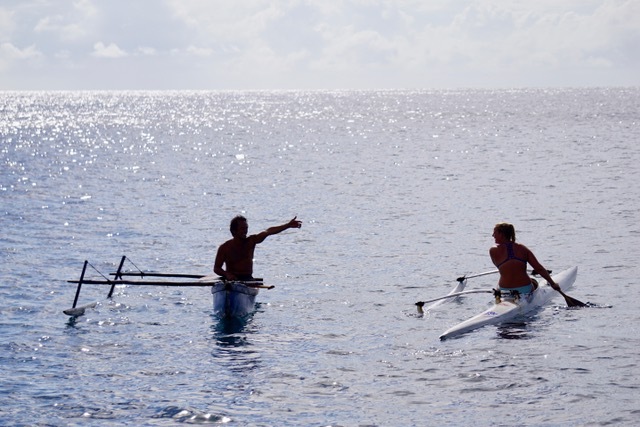 Mycah told Atea that she wants to learn how to paddle an outrigger, so he has arranged to teach her. We have been welcomed with open arms into this village, and are excited to meet more of the people and see more of the surroundings. 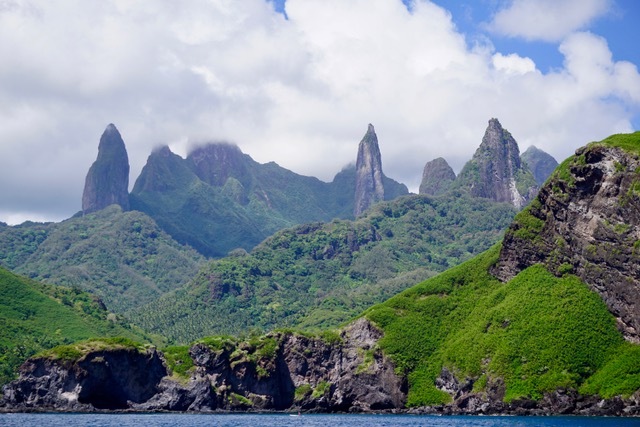 We’ve been debating whether we wanted to backtrack a little and visit Fatu Hiva, which is where all the boats visit, or sail on to Ua Pou, where hardly anyone stops and is supposed to have the most dramatic scenery of all the Marquesas Islands. 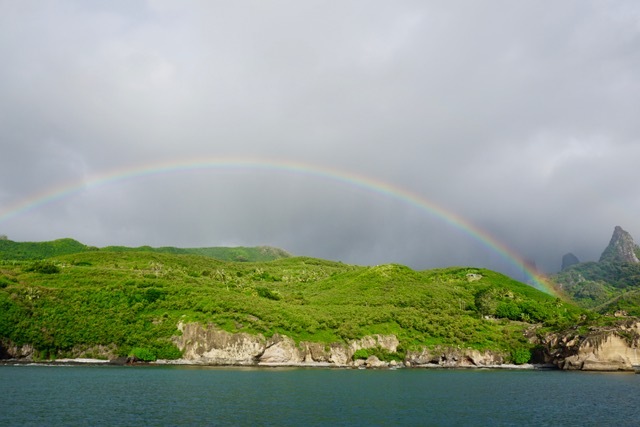 Since we aren’t into crowds, we decided to set sail for Ua Pou.On the way we sailed through a couple areas where sea birds were flocking and diving for fish in a feeding frenzy. 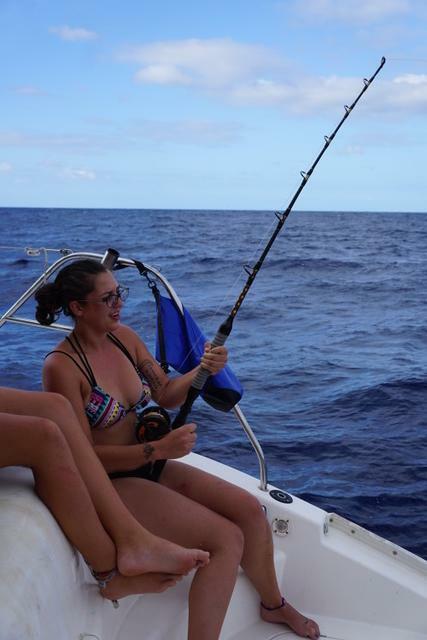 Kjira caught a tuna, threw it back since it was small compared to others we’d caught in the past, and as she was letting the line back out she caught another. That one was set free too. Emma caught one a few minutes later, and we threw it back too. Danny and I commented later how our fishing expectations have changed over the last two years. 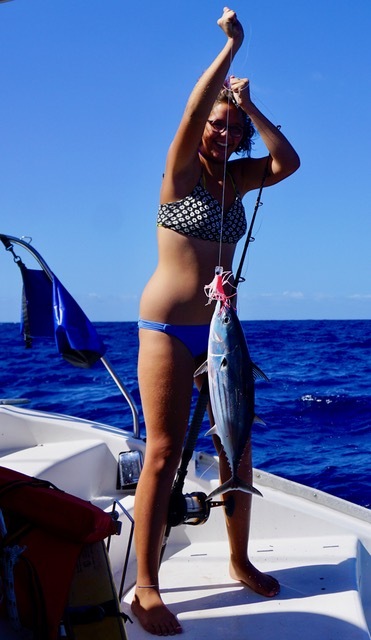 If we had caught tuna that size two years ago we would have proudly kept it! 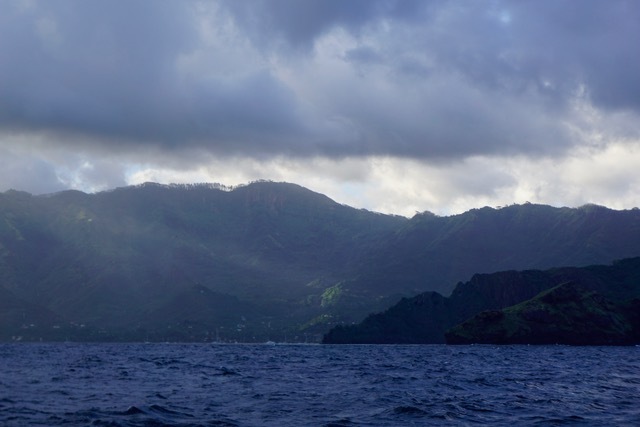 By the time Ua Pou stretched across the horizon, the sun was beginning to set but we could see rugged peaks and were excited to explore in the day light. 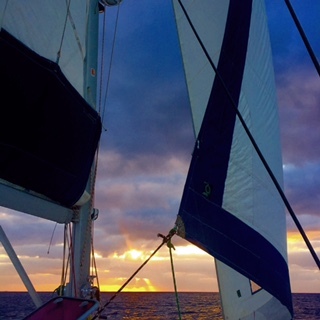 Thankfully our charts were accurate, and in the dark we were able to anchor safely. 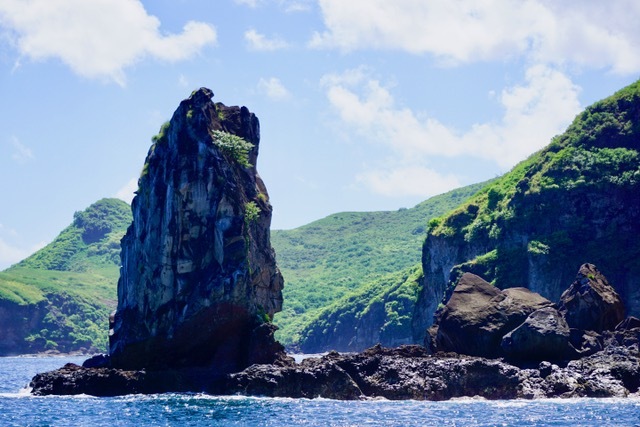 When we awoke in the morning we found ourselves surrounded by tall rocky cliffs and lush green foliage. 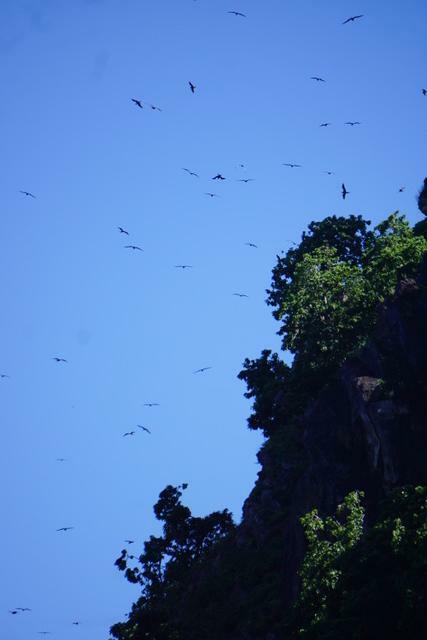 hundreds of birds soared overhead. 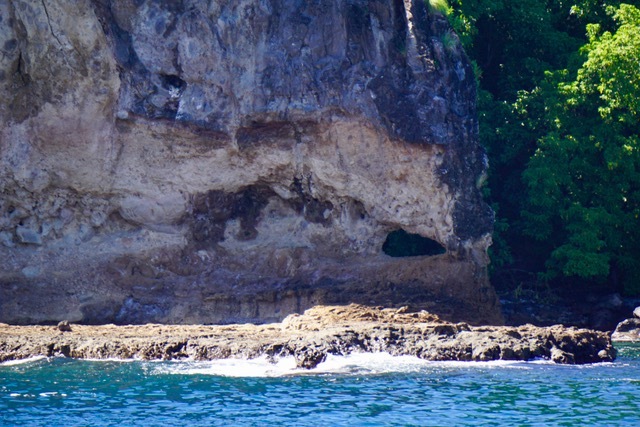 Waves gently splashed up against the rocky shores where small caves and holes worn through rock faces. I jumped into the water with mask, fins and snorkel, and found visibility to be poor and large areas of the surface were covered in a greasy film, and when diving down I noticed many feathers and gunk floated through the water column. It wasn’t until I was in about 3ft of water that I could finally make out rocks on the bottom. I decided that swimming at the base of a rookery was probably not ideal, and returned to the boat to shower off. 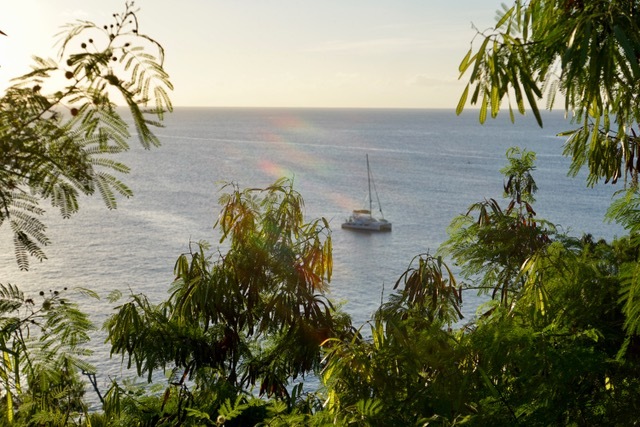 We motored out to see what we could see, and found ourselves in the most beautiful places. 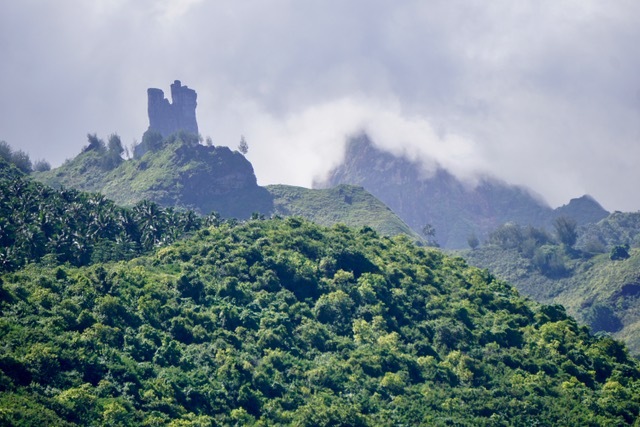 Tall spires reached up into the clouds like castles in the mist. 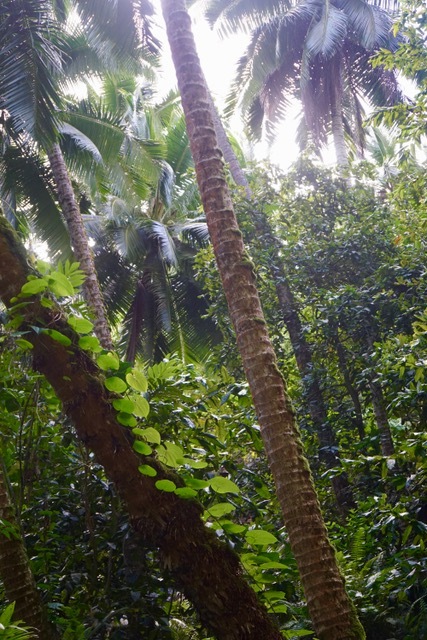 and surrounding mountain sides were covered in coconut palms and other dense trees and brush. 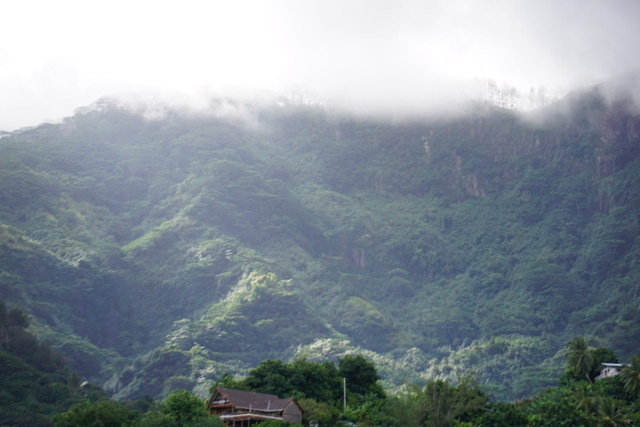 Periodically we’d pass a small village nestled among the trees. We all watched in awe, taking it all in, speechless by the incredible beauty. 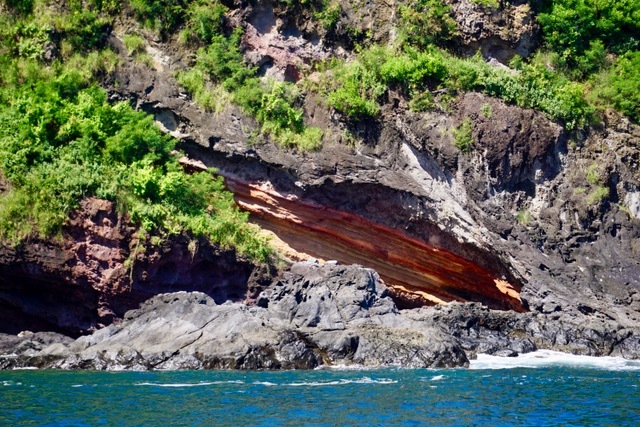 Periodically red bands of rock lay in streaks amid the darker rock, adding to the striking beauty. I thought to myself that this must be the most beautiful place on earth. 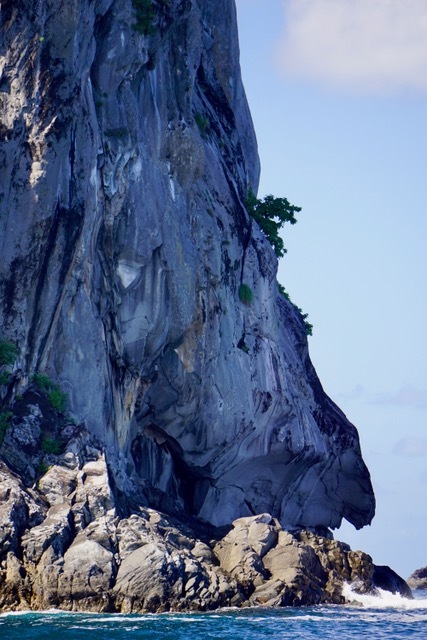 But, as we rounded a rocky point, we came across a scene that was even more dramatic…. It felt like we were in a movie, perhaps a scene from Lord of the Rings. 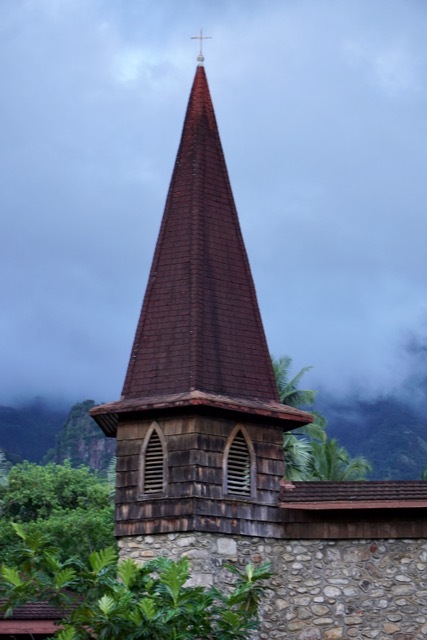 Notice the canoe in the water below to try imagine just how high these solid spires tower over us. It’s incredible! The bay we reached is Hakatou Bay, where a small village sits at the foot of this intense scene. We are so grateful to be here, witnessing this beauty. 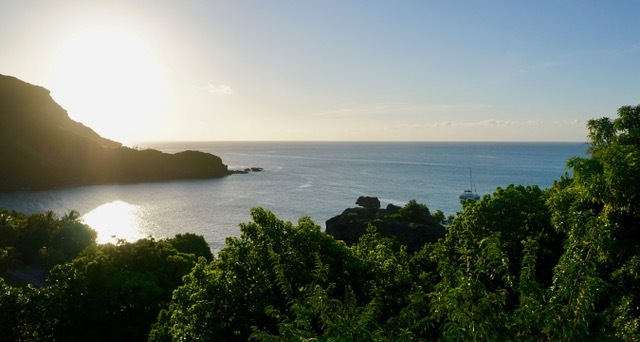 We live in an incredibly beautiful world and are excited to venture in to the village and meet the locals.